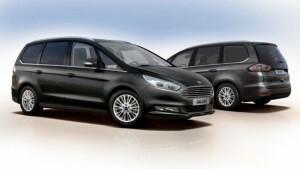 Why do Ford make two vehicles that are seven seaters? 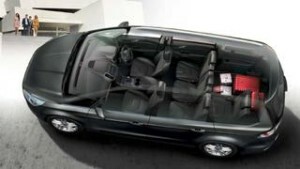 Along with the Galaxy Ford also offer the S-Max which is a very capable seven seater. The simple answer is that if you are serious over space or carry more than five people on a regular basis then the Galaxy is the best option. The S-Max may be sportier and only a few inches shorter but the Galaxy has the advantage of more headroom in the third row of seats, which also move backwards and forwards, so you can actually fit your weeks shopping and a pushchair in the car with all seven seats up, if you want a boot as big as a cave then drop the rear two seats flat and you have five individual seats with enough room to carry all the luggage and camping equipment for the family ‘Grand Vacance’. The Galaxy alongside its closest competitor the Volkswagen Sharan are two of the largest cars on the Scheme, the Ssangyong Turismo is bigger but we are waiting on more competitive pricing before it becomes a serious rival. This new Ford Galaxy has the updated Ford front which has definitely given it a visual lift, even if its lines are familiar. Internal quality has moved up a notch, all models come with an 8″ touchscreen media hub with DAB radio and SYNC2 that will link your smart phone seamlessly. The Galaxy is available in the three familiar trim levels of Zetec, Titanium and Titanium X the basic Zetec car comes with 17″ alloy wheels, dual-zone climate control, front and rear parking sensors, all-round electric windows, power start button and front fog lights. Titanium adds intelligent cruise control that keeps you a safe distance form the car in front, built in Sat Nav, privacy glass, LED running lights, automatic lights and wipers, electronic climate control, keyless entry, lane keeping assist and a 10.1 inch electronic cluster display that replaces the traditional speedo and rev counter, which is a high quality touch. The Titanium X with its panoramic glass roof, leather upholstery, rear parking camera, heated front seats and active park assist is no longer represented on the Scheme due to the maximum retail price announcement as of January 2018. The Galaxy is surprising easy to drive, it does not in any way feel van like or of a scary size, it actually feels narrower to drive than look at, it is however very long and while you have a good view of the front of the car from the wonderful driving position the rear feels a long way away making the dual parking sensors more than a little helpful. Comfort extends beyond the driver’s seat as all are wide and high up ensuring all passengers get a good view, in my experience this stops the children from feeling sick, the rear doors are enormous and wide opening ensuring entry into the rearmost seats is a doddle, the three middle row seats have Isofix and there is no problem fitting three child seats or housing three adults, the rearmost seats offer room for adults and the large windows help the car feel designed for seven unlike some large MPV’s where it feels a couple of seats have been bolted into the boot. 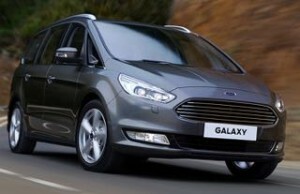 The Engines for the Galaxy are 150bhp or 190bhp 2.0 litre diesel. The 150 can reach 62mph in 10.9 seconds and is more than adequate. 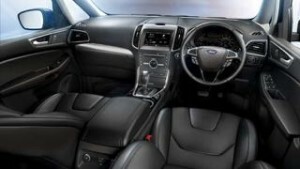 For Automatic drivers the gearbox has changed from a Powershift six speed to an 8 speed auto gearbox. The new Ecoblue 190 2.0 diesel, 55.3 mpg is an option as a Manual or Automatic but the prices are a touch expensive at £2895 and £3695 respectively. We have ruled out the 1.5 litre petrol as the fuel economy will struggle to reach 30mpg in real life driving. Only Titanium trim is avaialble this quarter.